However, this proverb is far more profound than its attempt at cleverness. All three are actually interrelated and two of them are the dominant aspects of our modern times. The cynic is the average person, having become enlightened, but since none of her traditional beliefs or values are reliable, she sinks in a reflexive false consciousness. The fanatic is the reactionary who, in rejecting the secular wisdom of the Enlightenment, inadvertently recreates a secular version of his traditional beliefs or practices in fundamentalism. As for the troll? She merely avoids the pitfalls of either dead end by transcending the modern times in her utilization of cheeky humor and avoids the sin of seriousness in mocking either caricature. That old Socratic dictum, that the unexamined life is not worth living, is even more naive than what it criticizes. Supposedly, the examined life is superior to naivete, because it exposes uncritical assumptions. But in this post-Enlightenment age, cynicism is triumphant. The Enlightenment succeeded in spreading a salient and trenchant critique of various traditions (revelation, religion, metaphysics, idealism, morality, and so forth). The assumed result of these critiques would produce rational and self-aware individuals freed from the hegemonic power of tradition and prejudice. Instead, the Enlightenment left behind a mass of cynics riddled with enlightened false consciousness, per Sloterdijk, who no longer believe in what they do, yet do it regardless. With the emergence of bourgeois society, knowledge bridged between the upper class and the working class and grounded its worldview on realism, which then dissolved the distinction between the classes. In the modern era, the cynic is now a mass figure, an average social character, rather than the result of an advanced industrial society producing a bitter loner. Cities became diffuse clumps without power to create public characters. In the modern urban and media climate, individualization declined. Therefore, cynics are integrated social characters, and no longer outsiders. No longer eccentrics, their cruel gaze disappear in the crowd and sink into anonymity. Cynics no longer see their cruel gaze as a personal defect or some amoral quirk without justification. They are now participants in a collective and realistic and attuned way of living. Therefore, the enlightened is always the non-sucker. Psychologically, the cynic is a borderline melancholic. He can control the symptoms of depression and be able to work. All modern institutions are infected with diffuse cynicism, as a “chic bitterness.” The cynic can see the utter pointlessness and meaninglessness of it all. Their psyche is elastic enough to incorporate a permanent doubt about their own activities. They understand what they do, and do it out of circumstances and self preservation. Therefore, cynicism is an enlightened false consciousness. Fundamentalism is the reaction of the major faiths against the secular wisdom of modernity that emerged from the critiques of the Enlightenment. 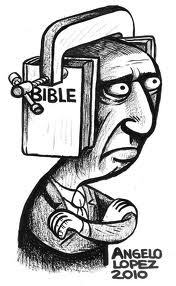 In a world inhospitable to what they regard as the religious life, fundamentalists believe that modern secular society is attempting to destroy religion. This secular society of modernity is due a shift in civilization between the 16th and the 18th centuries where technology replaced agriculture, leading to the discrediting of mythos and the dominance of logos. In the pre-modern world, myth and logos were distinct yet equal modes of discourse. Myth gave meaning of human existence, a safety net that prevented existential despair. Logos was the source of practical and rational discourse necessary for using tools and building homes and cities. Both modes of discourse were complimentary, but distinctly competent. Once myth was discredited, religion had to be recast in the mode of logos, leading to fundamentalism. Copernicus’ theory of a heliocentric universe delivered a fatal blow to the mystical perception that had reigned for thousands of years. Although Copernicus, as well as Galileo thought their science was compatible with religious vision, for logos supplemented mythos, the paradigm shift forced people to not trust their perception like the pre-moderns did. Up till then people could just be satisfied with the evidence of their senses, and see through the apparent aspects of the world to the Unknown beyond, because they thought the apparent aspects corresponded to a fundamental reality. But after Copernicus, the seeming stable earth is actually moving very fast, and the planets seemed to move only because people projected their on vision onto them. In other words, what seemed objective is actually subjective. Logos and myth ceased to be in harmony, and the rigorous logos of the scientists devalued the perception of the average joe, and made him more and more dependent upon the expert. Where myth placed human beings within the essential meaning of life, logos pushed them to the marginal position in the cosmos. By the 18th century, the Age of Reason, thinkers like Locke had enough faith in human reason to be confident that nature would give sufficient evidence for a Creator, and if people reasoned freely, they would arrive at the same truth themselves. The false or superstitious ideas of religion were the fault of the priests who employed tyrannical methods to force people to accept their orthodoxy. Other Enlightenment philosophers saw religion rationally, as deism, and rejected older faiths that were based on revelation as naïve versions of natural religion. Faith is rational, they thought, and interpreted the old truths of mythos as though they were logoi. The Christians concern with doctrine turned their myths into scientific facts and established a mutant discourse that is neither scientific nor religious. Today, protestant fundamentalists read the bible in a literal, rational way that is foreign to the mystical, allegorical approach to the premodern time. But religious truth is not rational in nature and cannot be proved scientifically. The mythoi of the Bible had never pretended to be factual in the way that American Christians like Arthur Pierson thought. Mythical language cannot be adequately translated into rational language without distorting its raison d’etre. It contains meanings that were too elusive to be expressed any other way, much like poetry. If theology becomes scientific, it ends up with a caricature of rational discourse because its truth are foreign to rational demonstration. That is why protestant fundamentalists tend to overlook the intuitive and mystical, resulting in the loss of touch with the unconscious, i.e, the deeper impulses of humanity. Between the fanatics of fundamentalism and the cynics of modernism, what is left? Sloterdijk offers a possible solution: Kynicism. In its Greek origins, kynicism is essentially cheeky, a type of argument that serious thinking had no idea how to respond. When Plato spoke of hoary concepts like the Eternal Forms, the kynic replies by farting. Is fartiness an Eternal form that God discharged in his meditation during Creation? Such provocation is termed as Trolling today, but it was a legitimate form of discourse dating back to Diogenes. The troll resists the rigged game of discourse of either the cynic or the fanatic, by rejecting their rules. Her cheerful cheekiness distinguishes her trollery from the malicious cynic or the blinkered fanatic, and argues with her entire body. Both the troll and the cynic have an enlightened consciousness, but the cynic’s is false because his consciousness has made him miserable. The troll’s enlightened consciousness is superior because she is cheerful and life affirming, as well as cheeky. Both the troll and the fanatic are infected by logos, but only the fanatic has lost mythos in his literal, humorless reading. The troll recalls mythos as meaningful in her search for cheeky humor. Conclusion: Better a cheeky troll than a miserable cynic or a blinkered fanatic! Previous Previous post: Change the World?